Hello, I’m Nina and I love traveling and cats. Though my social media posts may seem I am super crazy about cats (and I am! ), I can’t say that I love them as much as I love traveling — travel is something that is constant in my life, which resulted to me not even having a cat. I figured that since I’m away a lot, it wouldn’t be fair to the kitty that I will be adopting. And that is why I go crazy whenever I come across a cat. 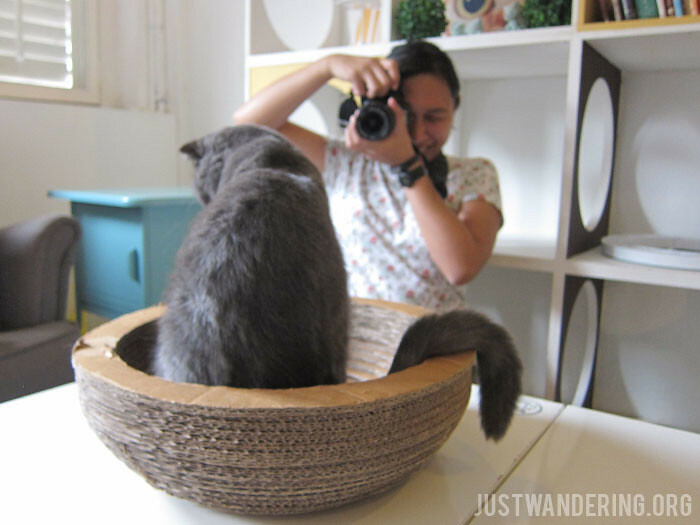 This post is (hopefully) a first of a series of blogs that I will be publishing about stalking cats I’ve encountered in the different cities and countries I’ve been to through the years. Towards the end of July found me and my fellow crazy cat lady (who actually has a cat) friend Cla flying off to Penang for some serious street food eats. For the first part of our trip, we stayed at Shangri-La’s Rasa Sayang Resort in Batu Ferringhi before moving to the Bayview Hotel in Georgetown. 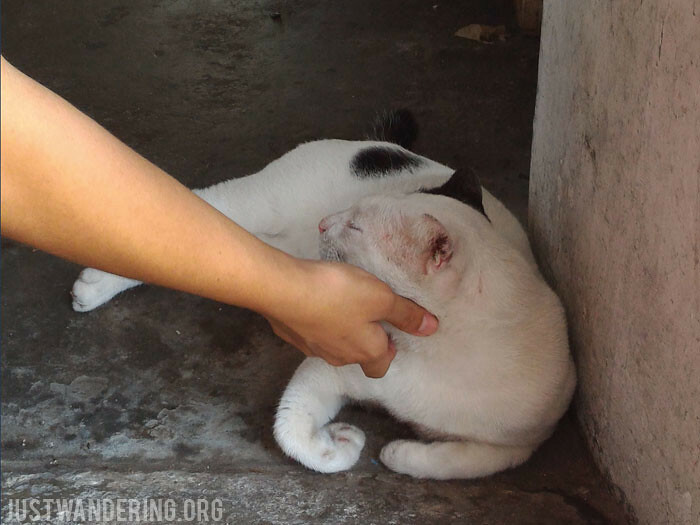 We did not encounter many stray cats in Penang, which I take as a good sign. We’ve only encountered a couple while dining by the roadside in Batu Ferringhi, and while walking in Balik Pulau (though these seem to be shop kitties). However, there are still places in Georgetown that will excite any cat person. When the city of Georgetown commissioned artist Ernest Zacharevic to draw some mural around town, tourists started flocking to take pictures of them. 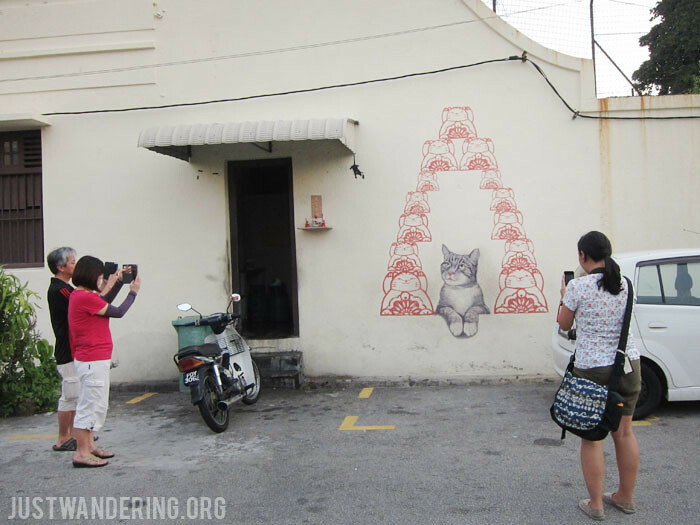 While many other street art and installations have popped up since then, it was the cat-themed art that piqued our interest. Lucky for us, they are located near each other. 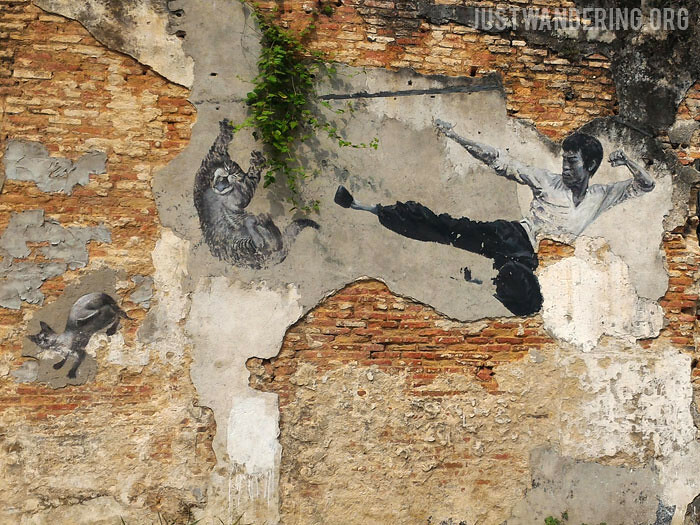 I’ve created a Google Maps based on the Penang Street Art map that Timothy Tye of Penang Travel tips has created, and marked the kitty arts with a green star. Load this map on your phone, and you’ll be set. Not a fan of mobile devices? 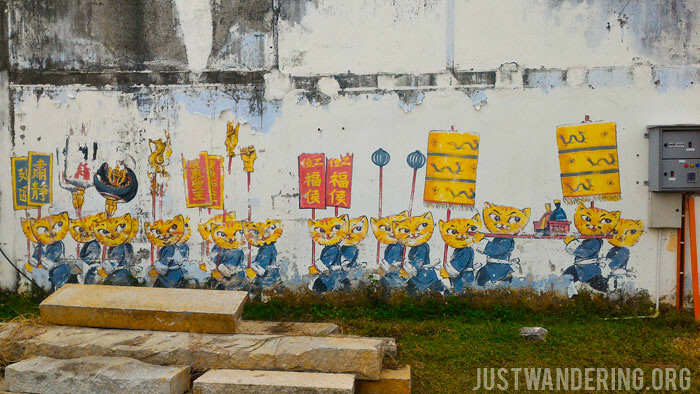 Grab a copy of the Penang Street Art Walking Map at the Penang International Airport upon your arrival. 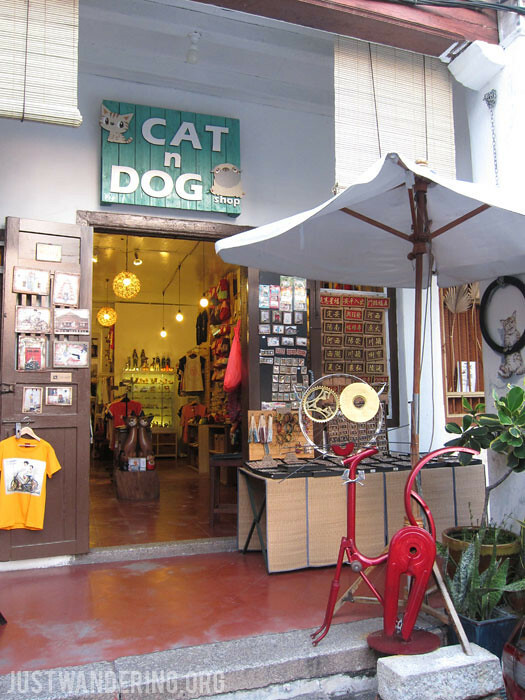 Located right beside the Owl Shop (which is, I suppose, a themed shop for owl lovers), the Cat N Dog Shop is right smack in the middle of things: it’s practically next door to the Khoo Kong Si clan house, which is one of the must-see attractions of Georgetown. 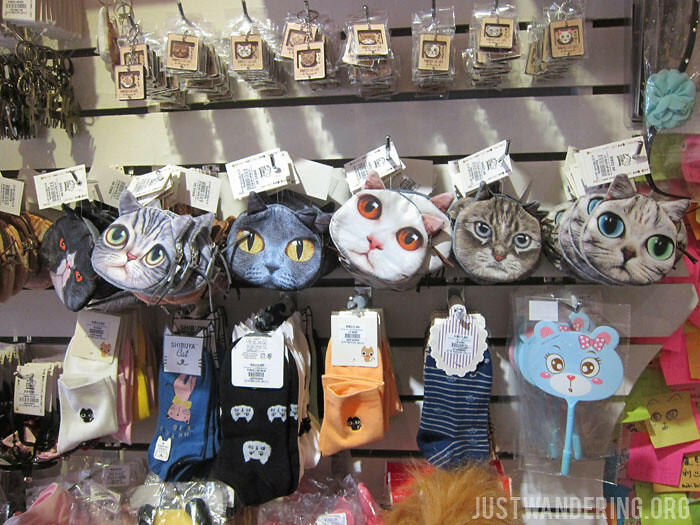 Though the name of the shop alludes to both animals, the goods inside are 80% cats and 20% dog. 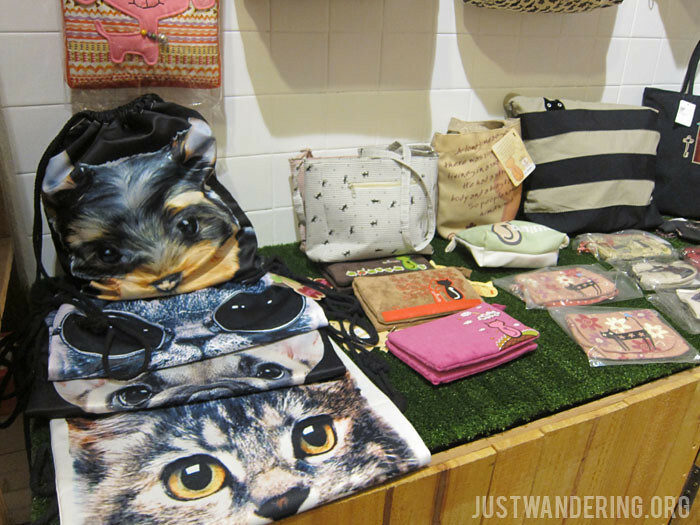 There are clothes, accessories, bags, notebooks, and various knick knacks for humans that has a cat or dog in its design. 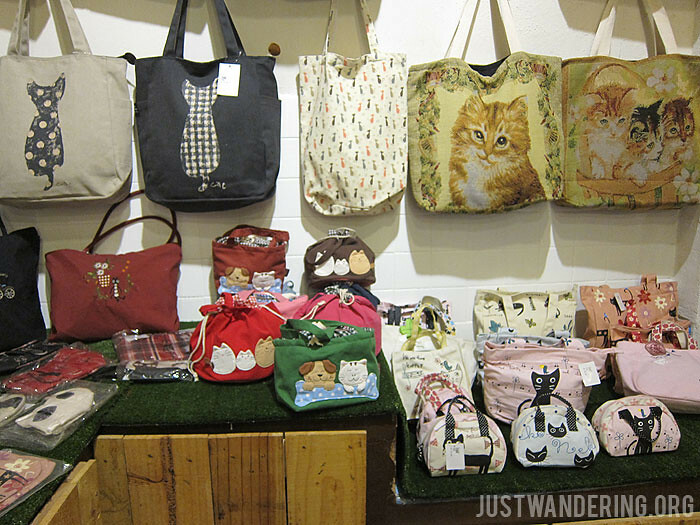 You can buy trinkets for as low as RM 5, though bags start at RM 20. 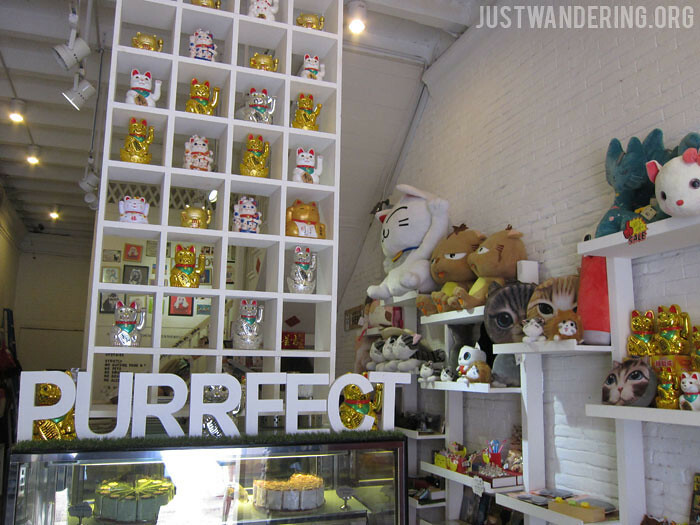 The Purrfect Cat Cafe is Penang’s first and I think only cat cafe. Located in Jalan Muntri, the cafe is a great place to cool down and relax after a walking tour of Penang’s street art and heritage buildings. There are also a number of hostels and guesthouses nearby, so you might want to look into staying there if you want to be close to the cats. 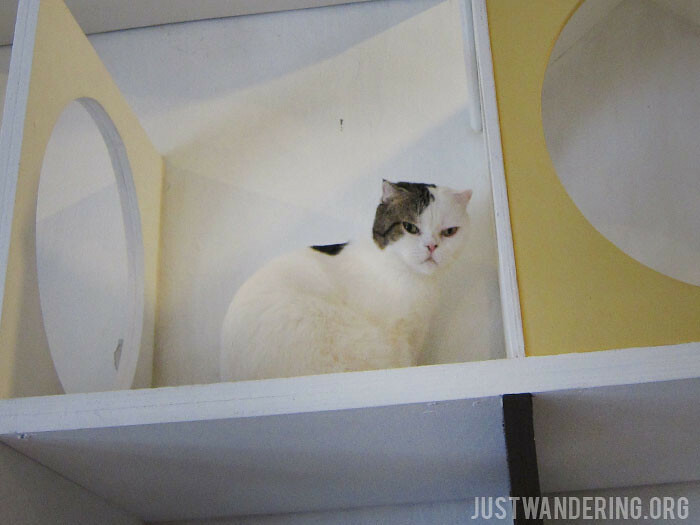 The cat cafe is in a two-storey shop house. The ground floor is a shop where goods for both humans and felines are available, while the second floor is the cafe itself. The dining area is separate from where you can interact with the cats. 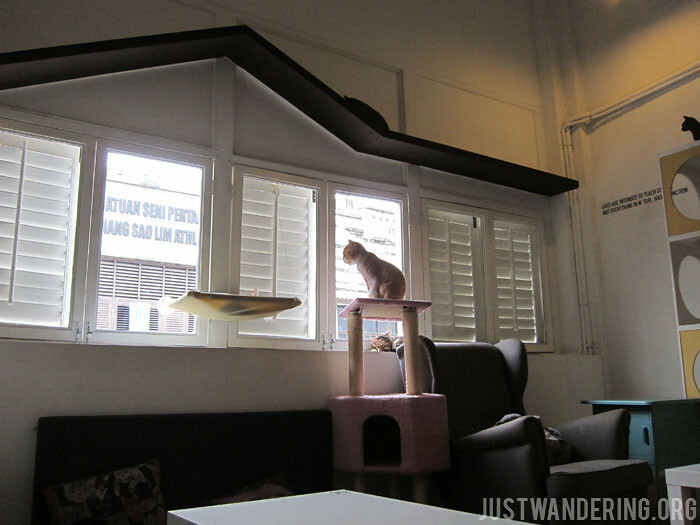 There is no set admission fee, but there is a minimum spend of RM 18 to enter the cat cafe. While I see many grumbling about this policy, I am happy because you can choose to spend either on the cafe food and drinks, or at the shop. The cat enclosure has floor cushions lining one side of the room and a wingback chair right between the cat tree and the litter box. We came in around 3pm, and all but one cat are snoozing. Orange, a grumpy looking Persian, ignores our fawning, yet eagerly sniffs my bag and is excited to play. Unfortunately, there were no cat toys around, so I had to do with dangling my camera’s strap for him to bat at with his paw. RELATED: Want a free trip to Malaysia? Still, we liked the cafe, and I would have gone back (even if it was just to buy more stuff at their store), but I got foiled by the sudden downpour. At least it saved me from going over my shopping budget again. To use in your own Google Map, click on the sharing button, and then click on Download KML. In Google My Maps, click on Add Layer and then Import. Enjoy! SO. MANY. 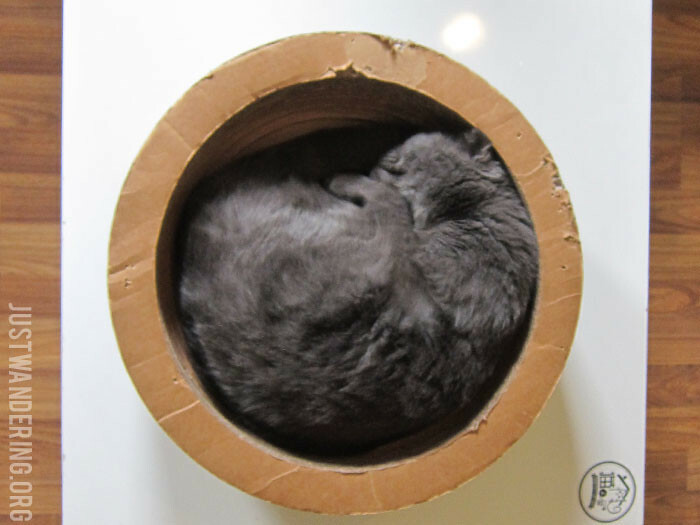 CATS. I used to, well maybe I still am, a cat lady. 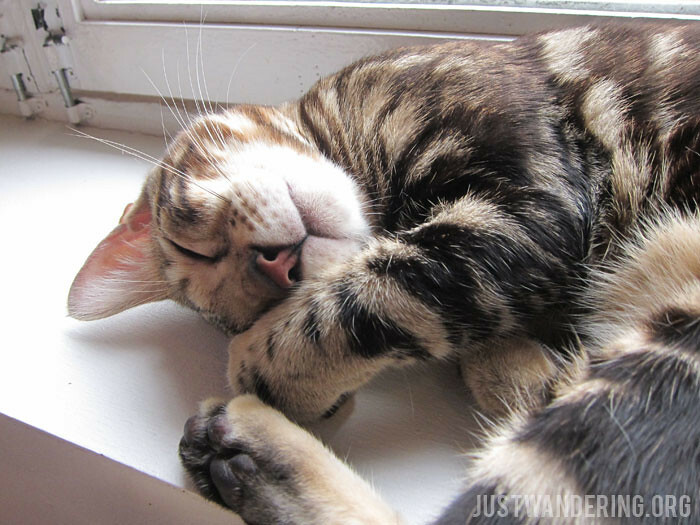 There’s this cat lady in me that still longs for one, even though, to be honest, Obi doesn’t even demand that much. But he’s not a cat. Anyways, there’s a cat cafe opening here soon. I am so looking forward to it! Cat cafes are so awesome!! I’m so excited for you!